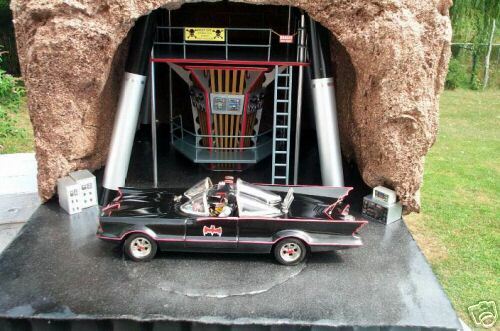 For years, I had mused about creating a full-on, Batcave diorama in my favorite scale – 1:25. It seemed like a great idea to house some of the many models I had created and also for a fun, large-scale project all its own. I had been inspired by my friend Mike Stutelberg, whose own Batcave diorama is nothing short of breathtaking. It always seemed like a huge project and so years later, I still had not started it. Then, in 2004 a few things happened to kick-start my gumption. 1. My (then) 4 year old son had acquired a model railroading video that he watched over and over again, as 4-year-olds do. And I watched it with him and soaked up some great fabrication tips. 2. Over the Christmas break, I noticed an eBay auction offering a custom 1:25 Atomic Pile model. I thought it looked great and was amazed to see the Atomic Pile modeled in 1:25 scale and actually ON eBay for sale! I won the auction and when the model arrived I was amazed by the build-quality: Welded metal struts, cast resin panels, multi-media textures – it was very well done. I then realized that here was my answer. This was how the diorama model could get built – by supplementing our own work with pieces by other craftsmen. It would still be a huge, time-consuming folly, but it just might work! I decided that I wanted to get an Atomic Pile model that was NOT anchored to a smaller cave setting like this one was, so I contacted the builder, Jim Graham and asked him to make me another one. The new Atomic Pile would be freestanding and able to be utilized in my larger planned cave diorama. Now, how to house it, and what it would actually entail were the next questions I had to tackle. Luckily, having a 4-year old telling you that anything, no matter how ambitious, is just what has to happen – is all you need to shame you into taking any project on. And so, a Batcave – That’s it. It’s an omen. We shall model – a Batcave!